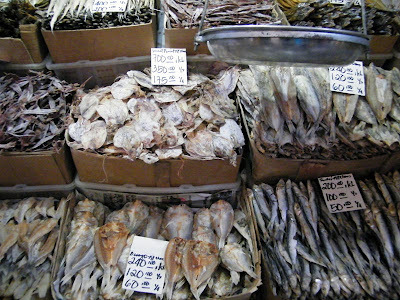 The sign on top of the box of dried squid read: "Sweet Pusit, P175.00/ kilo. It's the word "sweet" that got me. I mean, who can resist sweet squid? So I bought some for breakfast. Sweet for squid is not in the sugary sense. I don't know how to place it though... but the squid is just so yummy! It's not salty (considering it's from the sea), it's not sour (save for the vinegar dip)... there is indeed a sweet tone to it. This goes very well with a vinegar dip sprinkled with ground pepper and with a couple of crushed garlic. Make sure fried rice is in abundant supply! It's one of my favourite breakfast (and lunch, and dinner) items ever! I took the above photo when were were in our final days of our Philippine vacation. It's not that easy to get dried squid here in New Zealand (unless I'm looking in the wrong Asian stores! ), so I know I will sorely miss this. 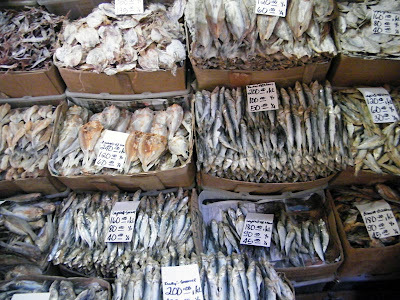 Dried squid and a host of dried fish can be bought from the local Baguio City (Philippines) market. There's this alleyway running parallel to the lane which tourists frequent. Just cross through one of the many passageways and you'll be in the black market area (where they sell PX goods and exchange your dollars for pesos), cross through again and you'll be where shoes are sold in one section and coconuts in the other. In the middle of this lane is where there dried fish are. Of course, the fish is brought to the city from the lowlands, usually from La Union or Dagupan. 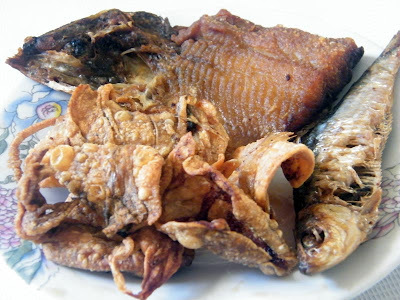 But dried fish is a staple in these regions, be it fried or as an ingredient of another dish such as saluyot or dinengdeng. I also love danggit, which are small, dried fish and is popular in Cebu. Speaking of which, I visited this dried fish market in Cebu in 2007. The place is called Taboan. You will smell the place even before you see it! But it's a wonderful place to get your dried fish pasalubong. Just make sure you take a nice, long bath first before heading for the airport! Until our next Philippines vacation (or until I find a store here that sells this), I have this photo as memento of my favourite breakfast ulam... the sweet pusit. I couldn't stop eating it... so irresistably yummy! My mouth is watering right now. YUM!!! tama,mapaparami ang kain with sweet pusit! unli rice ang katapat! lol! best regards!